A grand jury in Wyandotte County, Kansas has returned an indictment against waterpark and resort operator Schlitterbahn and one of its managers, charging them with “involuntary manslaughter, aggravated battery, and reckless endangerment of a child” over the 2016 death-by-decapitation of 10-year-old Caleb Schwab on the world’s tallest water slide, the Kansas City Star reported. Per the Star, a 47-page indictment says company management including Schlitterbahn Vacation Village operations director Tyler Austin Miles recklessly ignored safety standards, warnings from engineers, and their own lack of experience when designing Verrückt, a nearly 169-foot water slide that sent riders up a second hill at roughly 70 miles per hour. 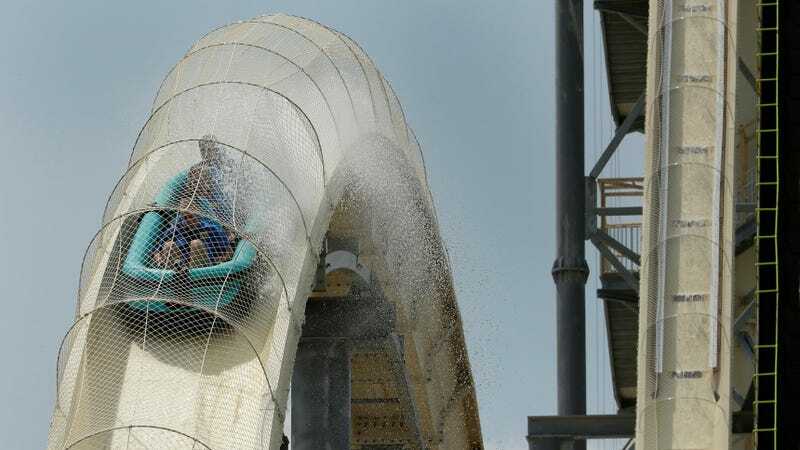 The indictment accuses the company of building the slide to impress the producers of the Travel Channel’s Xtreme Waterparks, opening the ride before it was completed despite numerous warnings from people involved in its construction, and then covering up the resulting injuries. This went on until Schwab’s raft went airborne on the ride’s hump in its second year of operations, sending him into a collision with a poorly-designed netting and metal brace system that cut off his head. Two other people were severely injured during the incident. The netting and metal brace system, which the Star reported experts told Kansas Attorney General’s investigators was “obviously defective and ultimately lethal” and the indictment claimed showed “extreme disregard for human life,” can be clearly seen in the photos below. Verrückt was ultimately scheduled for demolition in 2016, though the slide was still in place in November 2017 pending the outcome of an investigation. “We decided to have a completely different shape of the hump, and we had to shorten up the bottom radiant turn because of the G forces involved. In two or three weeks, we took down two thirds of the slide, reconfigured it, and got it back up,” he said. After determining that their new design was probably non-lethal, Schooley and Henry gave it another spin. By July 2, the team had completed their 100th consecutive successful sandbag test, plus the two men’s tests as human guinea pigs. And now, finally, they’re just about ready to open for business. Schwab’s family reached a $20 million settlement with “several parties involved in the construction” of the slide, the Star added. If convicted on the involuntary manslaughter charge, Miles and the company could face a sentence of 31-136 months’ prison time and a $300,000 fine.